Frosty weather is part of the winter season, whether we like it or not, but that doesn't mean you can't be warm and cosy. In our house, the temperature is what my husband likes to call a "comfortable" 68 degrees. His idea is you can always throw on an extra sweater to feel toasty and more importantly, a lower heating bill makes him smile. 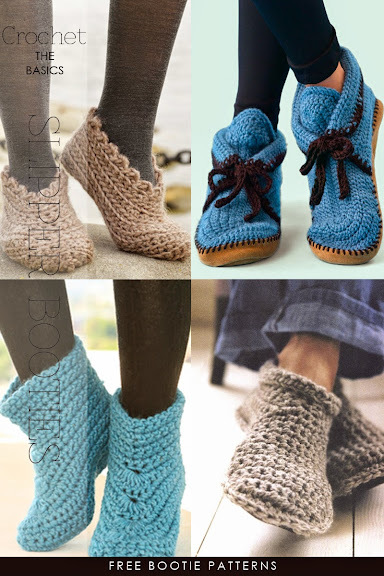 My feet are always cold and I love to wear slippers that cover my whole foot, almost like a bootie. 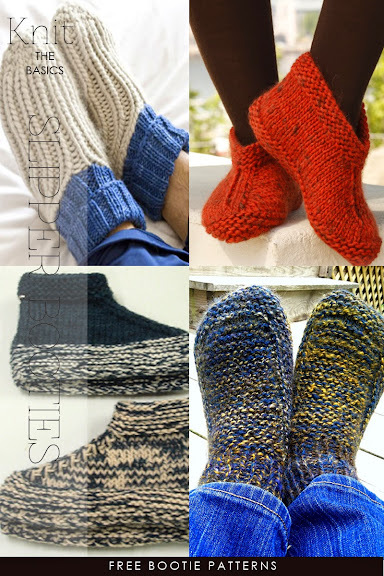 There are so many patterns for slippers and a popular past post had a lot of different free patterns and styles. 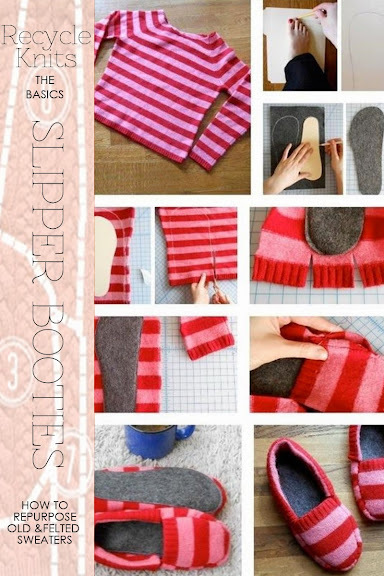 This post is all about all the different ways you can make slipper boots, whether it's looming, knitting, crocheting or recycling old, felted sweaters. For those of you who would like to know more about looming, read further for more information, a video and a link to a wonderful site. 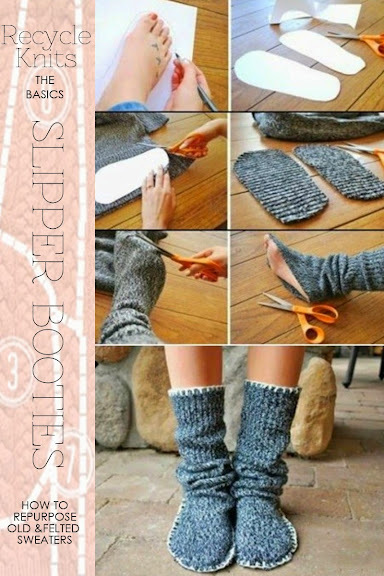 Read further for free patterns and tutorials to loom, knit, recycle and crochet your own pair and as gifts for friends and family. 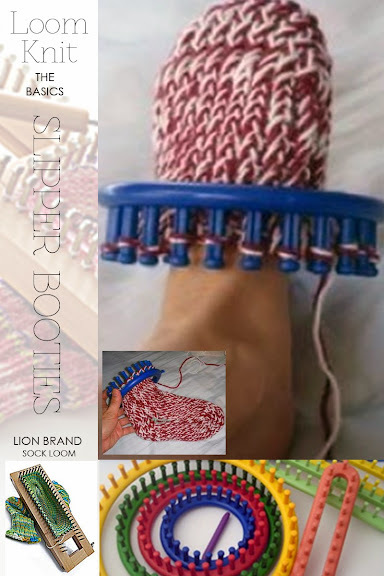 As you can see from the illustration, there are are different looms available and a special sock loom that adjusts for length of socks. 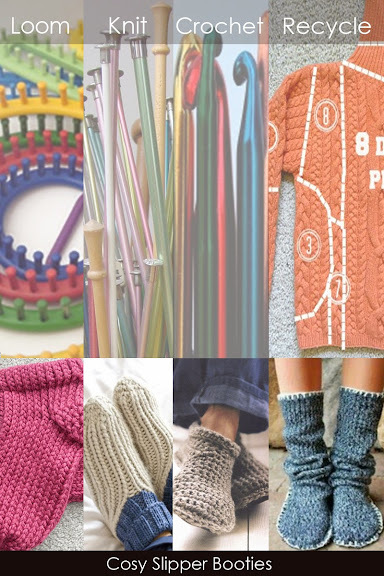 Click on the image below for a truly helpful site when learning about knitting with looms and for different patterns to be made with looms. Personally, my preference is an old, wool sweater that's felted as the fibres have constricted together into a solid piece of warm and cosy fabric. This resulting fabric is easier to cut with no fraying and sewing the pieces together is easier. 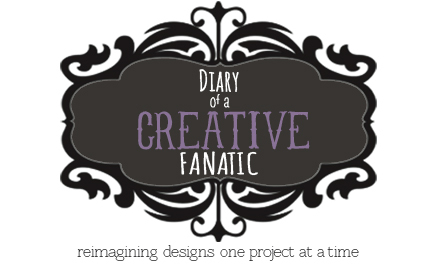 Happy Knitting, Recyccling, Crocheting and Looming!